Sonic Infusion is a social refreshment that will energize, recharge and inspire your creative circulation for the week ahead. Cultivating a soothing ambiance necessary on Sundays, Sonic Infusion blends familiar and obscure soundscapes by DJ Kryptk, an artistic installation by Shyama Kuver of Heart Over Crown, and tarot reading by Malaya "StarShine" Nicole of the Honeypot Hangout. Come sip our signature Juniper cocktail, find a new friend or reconnect with your existing favorites. Either way, you'll leave feeling complete. 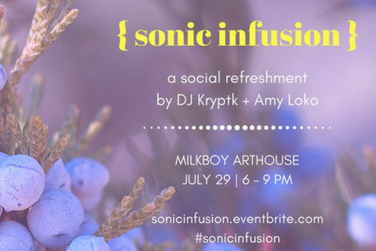 Sonic Infusion is crafted by Amy Loko and DJ Kryptk in partnership with The Clarice and MilkBoy ArtHouse.